Tennis Canada announced on Wednesday that Bianca Andreescu (Mississauga, ON), Rebecca Marino (Vancouver, BC), Françoise Abanda (Montreal, QC) and Gabriela Dabrowski (Ottawa, ON) will represent Canada in the Fed Cup by BNP Paribas World Group II first round tie against the Netherlands on February 9 and 10. The tie will be played at Maaspoort Sports & Events, in ‘s-Hertogenbosch, Netherlands. 18-year-old Bianca Andreescu will be representing her country for the eighth time. She holds a record of five wins and three losses in singles and is undefeated in doubles, having won all three of her previous encounters.The Ontario native has had a remarkable start to the season, as she recently won her first WTA title in Newport Beach, California. 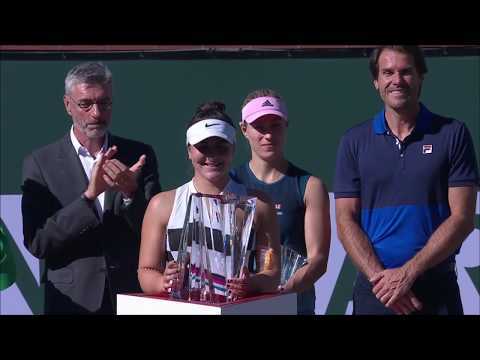 Andreescu also defeated the former World No. 1s Caroline Wozniacki and Venus Williams at a tournament in Auckland, New Zealand. Rebecca Marino will be making her first Fed Cup appearance since 2011. She holds an overall record of 2 wins and 3 losses while representing her country and will be competing in only her third tie. After retiring from the sport in 2013, Marino made her return to professional tennis in 2018. In the first year of her comeback, she broke back into the WTA Top 200 after beginning the season without a ranking. Her 2018 campaign also saw her take home five singles titles. Montreal native, Françoise Abanda, will be taking part in her sixth Fed Cup tie, where she holds a record of five wins and five losses. She played a crucial part in Canada’s 3-2 victory over Kazakhstan in 2017, winning both of her singles matches over higher ranked players. At the Rogers Cup presented by National Bank last summer, she upset former world no. 13 Kirsten Flipkens in the opening round and just a few weeks ago she reached the final of the ITF tournament in Daytona Beach, Florida. Making her 12th Fed Cup appearance will be Gabriela Dabrowski. The 26-year-old represented her country for the first time in 2013 and holds an overall record of six wins and eight losses. Last year, Dabrowski won her second Grand Slam title in mixed doubles at the Australian Open and reached a career high ranking of no. 7 in doubles. She helped bring Canada to victory last April when she won the decisive doubles rubber against the Ukraine playing alongside Andreescu. Arantxa Rus, Richel Hogenkamp, Bibiane Schoofs and Demi Schuurs have been nominated to represent the Netherlands. Canada vs. Slovakia – Who is the favourite?